Kahneman's book is all about choices, and shows how greatly they are influenced by framing and anchors. While our decision processes are wonderfully rich and nuanced, they are highly susceptible to influence. Much of our decision making is based on the fast, intuitive, but error prone processes Kahneman calls System 1 -- with reluctant intervention by the slower, more deliberative and "rational" processes of System 2, which is often lazy, and also subject to systematic errors. 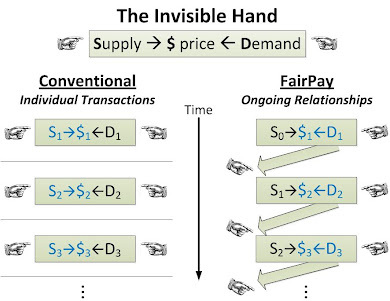 The basic opportunity in FairPay is that it changes from a model in which prices are imposed on buyers (take it or leave it...or shop elsewhere), to one in which the buyer chooses the price, but with incentives to consider whether the seller will judge it to be fair, in that particular context. This may seem to take all power from sellers, and expose them to buyers being unfairly cheap, but there is a counterbalance: The seller has the ultimate power to motivate fair pricing by controlling whether future FairPay offers will be made to that buyer. That gives buyer an incentive to price fairly, to gain the best future offers, and to avoid losing the FairPay privilege. The seller can also frame the offer, and set a suggested price as an anchor. Framing is very powerful and applies to both System 1 and system 2. Choices can be altered very dramatically by framing the choice in different ways. Framing of offers is central to making FairPay work effectively. The core objective is to make buyers feel the seller deserves a fair price, and to find incentives for pricing generously. Nudge is the title of another recent book on behavior, by Thaler and Sunstein, that makes much of choice architectures that can nudge behavior in very powerful ways. (Kahneman refers to this, noting his collaborations with Thaler.) A choice architecture is a systematic process for framing choices to induce desired behaviors. 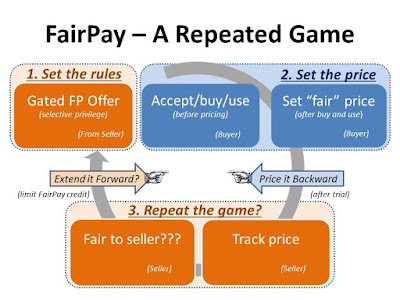 FairPay sellers can use such choice architectures to nudge most buyers to set prices to desirable levels. Anchors are an aspect of framing, in which a reference point for a price or other parameter to be chosen. Even where the individual is free to ignore the anchor entirely, it tends to have a surprisingly strong influence on the choice. FairPay exploits the power of suggested prices as psychological anchors to nudge buyer pricing choices. Intensity matching is one of the things the intuitive and automatic System 1 does easily. Matching prices to one's happiness with a product is easy. Thus choosing prices that match to perceived value is easy, and the desire to pay fairly for being delighted by a seller can be harnessed just as well, and perhaps better, than the competing desire to find bargains. WYSIATI (What You See Is All There Is) -- people (especially their System 1), tend to make choices based on just the factors they see, and even System 2 is lazy and tends not to search for other factors that may be missing. A key aspect of framing and choice architecture is to present those factors that cause buyers to notice what they should value (and to forget or discount any negatives) in order to nudge toward desirable pricing choices. The laziness of System 2 is perhaps most strikingly evident in the use of opt-in versus opt-out choices to set desirable defaults. Kahneman cites organ donation rates of 4% and 12% in two European countries where donation is opt-in, compared to rates of 86% and nearly 100% in two countries where it is opt-out. Thus making acceptance of a suggested price an opt-out choice (such as for ongoing subscriptions) might lead most buyers to be compliant, most of the time (especially once a comfort level is established). Decisions are affected by distortions in psychological weighting. --Loss aversion is stronger than gain seeking. Losses from an established position tend to be weighted more heavily than equivalent gains. Once a buyer has the privilege of setting prices under FairPay, they will be averse to losing that privilege (by pricing unfairly low just to get a small gain on one transaction). --Fear of disappointment also tends to be overweighted. The pricing-after-trial feature of FairPay eliminates the risk of buyer remorse, and that fear can be a significant barrier to buyers accepting a price corresponding to full value up front. So conventional prices are implicitly discounted in the buyer's mind to allow for the risk that the hoped for value will not be realized. FairPay removes that significant discount factor. Perceptions of fairness and entitlement are inherently frame-specific and not underlying. Kahneman gives an example where wages have declined in a down economy--most people view it as unfair for an employer to cut the pay of an existing employee (viewed as having a personal entitlement), but perfectly fair to fill an vacancy at the lower rate by a new employee (viewed as lacking that personal entitlement). By framing fair prices as being context dependent, such as based on usage, value obtained, ability to pay, and other factors, buyers can be nudged to accept prices that are different from those for buyers in different circumstances. Those who pay a higher price need not feel regret if they learn that another buyer paid less, since the fairness of the price depends on the circumstances (different entitlements in different contexts). Building on how System 1 and System 2 partner in making choices, an objective of FairPay choice architecture is to make it easy for the buyer to accept seller-suggested prices so that both buyer and seller maintain a happy and mutually valuable commercial relationship. 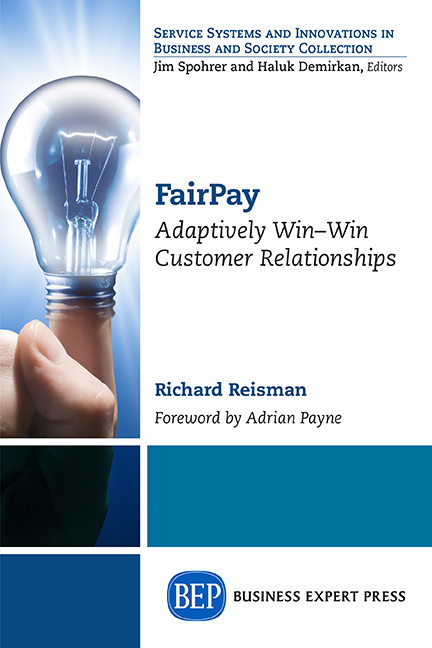 Repeated Experience: As buyers become familiar with FairPay, and with a given seller, they will gain comfort and ease. Primed Idea: Offers and pricing requests should frame the value proposition, the relevant context, and the suggested price to most effectively prime the buyer to accept it as fair. Good Mood: FairPay aligns the motives of the seller and the buyer -- if the seller delights the buyer and positions himself as a positive and deserving partner and provider of value, the buyer will find it easy to reward that (just as most people give good tips to delightful and effective waiters, and pay premiums to companies that delight them--like Apple). Feelings of Familiarity, Truth, Goodness, and Effortlessness will accrue and reinforce desired behaviors in continuing FairPay cycles. All of this suggests that effective choice architectures can be applied to make FairPay very effective for most buyers -- if the seller really seeks to deliver what the buyer values, in return for a fair profit for doing that. Isn't that the kind of economy we all seek? Speaking of the kind of economy we seek, some of this choice architecture may smack of exploitation of buyers by manipulative businesses, but remember -- this is in the context of a system in which buyers have complete power to set any price they think fair. The choice architecture is just a defensive tool for sellers to nudge buyers toward fairness in choices they have full freedom to make. The nudging of a choice architecture may be "manipulative" to a degree, but in the context of an unprecedented level of buyer freedom. Sellers need to have some compensatory powers (and it seems that abuse is unlikely and easily countered). The ultimate objective is to align buyer and seller behaviors toward achieving a mutually beneficial value exchange.